Games are increasingly becoming the focus for research due to their cultural and economic impact on modern society. However, there are many different types of approaches and methods than can be applied to understanding games or those that play games. 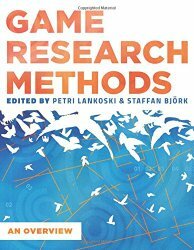 This book provides an introduction to various game research methods that are useful to students in all levels of higher education covering both quantitative, qualitative and mixed methods. In addition, approaches using game development for research is described. Each method is described in its own chapter by a researcher with practical experience of applying the method to topic of games. Through this, the book provides an overview of research methods that enable us to better our understanding on games. Dr. Petri Lankoski is an associate professor in game research at Sodertorn University. His research focuses on game design, character design, play experiences and development-based research.